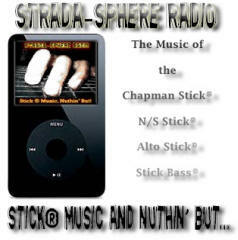 Strada-Sphere Radio is a multi faceted expression of love for the music of the Chapman Stick® family of tapping instruments created by Emmett Chapman. The original concept for SSR was to showcase the music of Stickists from Soundclick.com's roster of musicians who play the Stick®. The site featured a stream of Stick music hosted by Soundclick and eventually was expanded to include interviews with Stickists and reviews of their music. In 2005 a podcast was added to augment the sites content. Created, produced and hosted by Juan R. Leõn, The Strada-Sphere Radio Podcast is a 30 to 60 min show featuring the music of both known and not so well known Stickists from around the world. Each episode brings the listener a vast array of musical styles and a wide variety of artistic expression to satisfy even the most discerning of listeners. In 2007 Shane Carey, host of the popular and daring Nascent Music Podcast (a podcast documenting Shane's own improvised compositions on the Stick), joined the show as co-host and producer bringing to the table even more variety and surprises. Visit the Strada-Sphere Radio family of sites listed below and be sure to subscribe via i-Tunes and various other podcast aggregators. Featuring the original "Strada-Stream" hosted by Soundclick plus interviews, reviews,The Strada Store, and Podcast show archive page with embedded players. Extensive show notes and episode archive plus the latest news. The official Strada-Sphere Radio Myspace Page. Listen to the show, read the blog and watch some Stick You-Tube videos. Add us as a friend and leave us a comment!